My previous post ended in a cliff-hanger: would we actually leave Heathrow at all? In the end we did, and got to Tokyo only about three hours later than planned. Our hotel turns out to be a good one, and thanks to a recommendation from Cam (thanks!) 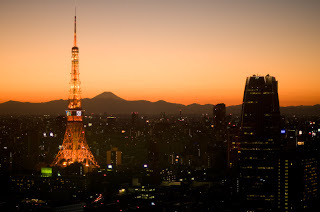 we've got a room with great views across Tokyo, past the Tokyo Tower and right out to Mt Fuji on the horizon. We checked in just in time for a fantastic sunset and then dragged ourselves out for a quick dinner before collapsing in an exhausted heap. Japan is much more into Christmas than I expected, what with it being a predominantly Buddist nation. It isnt actually a national holiday, but most kids get told about Santa and get presents and there are decorations everywhere. Just walking through the shopping malls near our hotel we've seen a whole range of light shows (with musical accompanyment and smoke machines, naturally). There are also Christmas markets galore and other special events too. We stumbled across one such special event last night whilst on our way back to the hotel after dinner. The thumping dance music and crowd of interested onlookers was what first picqued our interest. The center of attention turned out to be a Japanese dude with an easel. He was wearing some kind of portable mixing desk (to control the music DJ-style) and dancing around quite vigorously. 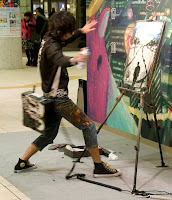 While doing this he was also painting a picture, using a range of paints, spray cans and charcoals. As you do. All quite normal, I'm sure. As he finished each picture he presented it to a member of the audience as a gift before switching tune and moving on to a new creation. When we moved on after 15 minutes he was on to his third picture, set quite appropriately to dancy festive music. Takes for the update. Good to see work is not getting in the way!! Be careful on your return car journey in the UK, slap each others faces to stay awake. Is that you dad? Surely slapping the driver of a moving vehicle isnt in the highway code!